New York: Schott c1937, 1965. Quarto, score (27 pp.) and part (8 pp.). G, some light marks in pencil in flute part. 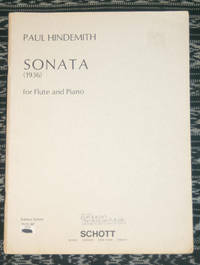 One of the 25 sonatas for orchestral instruments composed between 1935 and Hindemith's emigration to the United States.. Wraps. Very Good. 4to - over 9¾" - 12" tall.